Fairly easy trail, not much climbing. Some hazards are the technical parts of the trail trail being along a steep drop, beginners, of if your not sure of your abilities, walk your bikes here! I'd hate to see someone fall down this again. I'm not sure how the loop works, there are SEVERAL trails and dirt roads after the steep climb coming out of the valley. Lots of exploring possible here. I got lost and ended up at some youth camp and had to ask for directions. Very busy on weekends! 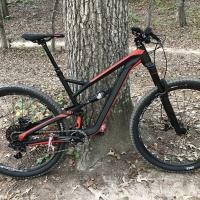 Review: This is a nice scenic little trail that is probably worth a ride or hike if you happen to be in the area, but I'm not sure I'd go out of my way just to ride it. I actually preferred to just hike it when I lived up that way. It has been a while, but I seem to recall exploring and finding an odd network of old mining roads in that area that I also rode on. Nothing special but fun if you like to explore by yourself. There is a private land and a camp there, so be respectful and stick to forest land. Review: There actually is a South Saint Vrain Loop that is just north of Ward I believe. I've never ridden it though. http://www.leelikesbikes.com/Stories/061304/ that site has a few pictures of South Saint Vrain, just so we don't get the two mixed up. Review: Easy trail, great scenery. I rode this when I first moved to Boulder and it was a nice break in and gave me a good look at what riding in Colorado was all about. Review: Colin the trail is not in Ward. It is ~ equidistant from Ward and Jamestown.Coming from nederland head north on 72(peak to peak hwy) go past ward and take right on hwy 94( you are now headed to Jamestown). It is ~ 1 mile to the trailhead on the left side of 94. Enjoy! Review: Your description is misleading and inaccurate. Ceran St. Vrain is in WARD, CO. Not Jamestown. Ceran Saint Vrain Loop MTB Trail 2.60 out of 5 based on 6 ratings. 6 user reviews.